Over 11 months of global touring, the 2015 Extreme Sailing Series™ will visit eight venues spanning three continents. Maintaining the highest level of sporting integrity in the same award-winning Stadium Racing format, the global tour includes a mix of iconic cities, established sailing venues and new markets of strong commercial value to stakeholders. Mitch boasts an enviable CV including 2 Olympic medals, 2 America’s Cup campaigns, 11 World Championship titles and 5 World records. Mitch is also the co-creator of the Extreme 40 boat. A great come back from Ben Ainslie, who is taking part at Cardiff’s extreme sailing series! Historically Olympic skiff sailors have proved most adept at making the transfer to catamarans – in the America’s Cup they include Artemis Racing skipper Nathan Outteridge and Luna Rossa helmsmen Chris Draper (Extreme Sailing Series winner in 2009) and Paul Campbell-James (Extreme Sailing Series winner in 2010 and 2011, now with Ben Ainslie Racing) plus London 2012 silver medallist Peter Burling, who shared the helm of the Emirates Team New Zealand Extreme 40 with Dean Barker last season. Sir Charles Benedict Ainslie, best known as Ben Ainslie, is an English competitive sailor. The most successful sailor in Olympic history, Ainslie won medals at five consecutive Olympics from 1996-2012, including gold at the last four. He was the first person to win medals in five different Olympic Games in sailing, the third person to win five Olympic medals in that sport (after Torben Grael and Robert Scheidt) and also the second to win four gold medals, after Paul Elvstrøm. Where is it happening? 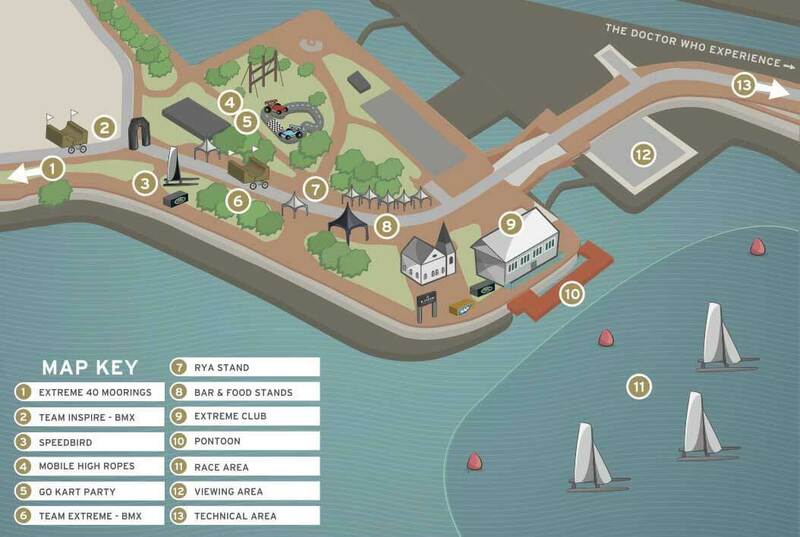 The adrenaline fuelled Extreme Sailing Series™ returns to Cardiff, with an earlier June date, as part of their eight Act global tour. Now a firm favourite on the Cardiff summer sports calendar, watch eight of the world’s top sailing teams battle it out in the Bay with Olympic heroes, America’s Cup winners and Round the World sailing legends going head-to-head within touching distance of the shore. The award-winning Stadium Racing format is ideal for spectators providing exciting views of the racecourse from the waterfront and Barrage. Whilst on land there’s something for everyone! On the Saturday and Sunday enjoy food and drink stalls, live music, ‘have a go’ activity sessions, as well as skateboard, rollerblade and BMX displays. Watch the racing between 2pm and 5pm across the 3 days, while the land entertainment will take place from 11:30pm to 6pm on the Saturday and Sunday only. For more information check out Extreme Sailing Series’ official page.